Jamie says: Which story should I tell? 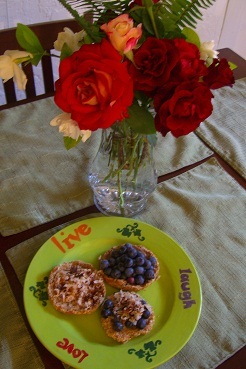 Do I thank my friend Lindsey, a dietitian at the VA Hospital, for introducing me to sprouted grain English muffins? Or do I thank my sister for making me this beautiful plate to match our kitchen flower pots? Or my Dad for letting me take some of his prized sweetened coconut flakes from home? Or do I say that the blueberries in this recipe are the ones I picked at Eunshil’s and the flowers pictures are the absolutely gorgeous flowers she gave me? Looks like I just told it all. Preheat oven to about 375°F. Spread coconut on a baking sheet. Toast until golden brown- about 5 minutes. Partially-defrost whole English muffin by placing it on top of a heating toaster. When it’s defrosted enough to slice, use a serrated knife and slice into thirds, not halves (as shown). Toast pieces in toaster. Spread almond butter on one piece. Top with blueberries. Spread Smart Balance on the other two pieces. Top one with blueberries and toasted coconut, and the other with toasted coconut. Serves: 1. Enjoy your trio sampler! Nutrition note: Sprouted whole grains are higher in many important nutrients, including vitamin C, B vitamins and folate, fiber, and the essential amino acids that are usually low in whole grains, according to the Whole Grains Council. Jamie says: Today I had the opportunity to prick myself with a lancet to measure my blood glucose. I started a new dietetic internship rotation this week- a diabetes outpatient rotation. About a year or so ago in class, we had to prick our fingers and giver ourselves pretend insulin- at that time, it took me some time to get up the courage to do this. However, this time I did it right away. I couldn’t believe myself. I think after watching patients over the past three days prick their fingers, I felt like it was the least I could do to have some insight into their lives. (I also counted the carbohydrates of this recipe.) I’m looking forward to learning a lot about diabetes over the next 4 weeks. Rinse and pat dry sprouts with a paper towel. 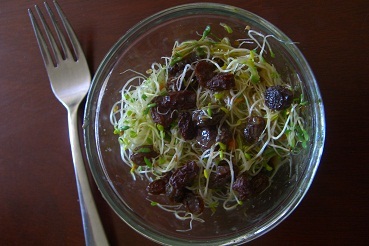 Add sprouts to a bowl along with ginger vinaigrette and raisins. Toss. Serves: 1. Enjoy! Light, refreshing, sweet, and healthy. 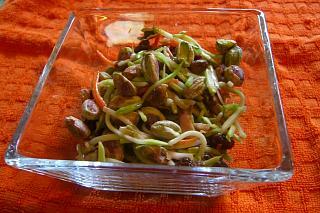 Nutrition note: This snack/side dish has 54 calories and 10 g carbohydrates. Jamie says: Are you a muti-tasker? I am (even with cooking)… but, I have to confess, it didn’t work this time. I figured I would start dinner and then drive my friend Melissa home after our fun adventure of shopping at the mall. Well, I got carried away in conversation, and just as we were finishing up, I got a phone call from the sis… the water boiled away and left the pot (with the sweet potatoes) to burn. I finally got the pot back to normal- after boiling water in it, soaking it with baking soda and white vinegar, and using all my arm strength with a Brillo pad. Luckily, the meal was still delicious, even without the sweet potatoes. And the conversation was totally worth it. Preheat oven to 400°F. Slice eggplant into 1/2″ circles. Cut circles in half; then cut halves into thirds. Place on a baking sheet. Cut bottom third of asparagus off and discard. Then cut asparagus in half. Place in a baking dish. Cut tofu into bite-sized pieces. Place in a large saute pan. Drizzle extra virgin olive oil on the eggplant, asparagus, and tofu. Sprinkle curry, coriander, cumin, and celery seed on top. Mix well. Bake eggplant and asparagus for about 1 hour or until soft and lightly brown. After the eggplant and asparagus have cooked for about 45 minutes, cook rice and water in a microwave-safe bowl in the microwave for 7 minutes. Stir. Set aside. Meanwhile, cook tofu on medium heat for about 7 minutes. When everything is done cooking, mix eggplant, asparagus, and tofu one of the pans. Sprinkle with sea salt. Scoop rice into a bowl and top with veggies/tofu mix. Serves: 2. Enjoy! Kathryn thought the dinner tasted like Krishna lunch (which is awesome if you’ve never tried it). 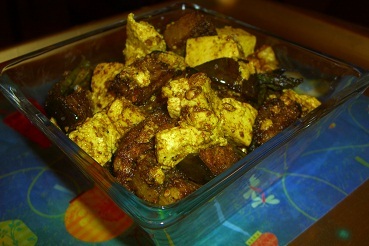 I liked how the tofu and veggies took on the bold flavor of the Indian spices. This was probably the best asparagus I’ve made- soft and lightly brown. The eggplant soaked up the extra virgin olive oil like a sponge (good though). Nutrition note: Ever tried coriander? How about cumin? Try a new spice this week. It can add a lot of flavor to healthy vegetables and meats- making them even more appealing to eat. Jamie says: I went mulberry and blueberry picking this weekend! Eunshil, the past president of FDA and a fellow GDDA member, brought her home-grown and picked mulberries to a recent GDDA meeting. Everyone raved over how good they were, and she invited us over to pick the fruit. My friend Lorielle, aka my “twinnie,” also joined in on the festivities. I learned blueberries grow on these wild bushes and mulberries grow on trees- not bushes; this new fact about mulberries growing on trees changed my life (I’m exaggerating of course, but that children’s song about going around a mulberry bush had me fooled). Berry-picking was so relaxing and so much fun. We talked and laughed and, by the end, had purple fingers (and shoes and legs and shirts) to prove of our adventure. Add all ingredients to a small blender. Blend well. Serve in a cocktail glass. Serves: 1. Enjoy! Mulberries taste like sweeter, less-seedy blackberries. 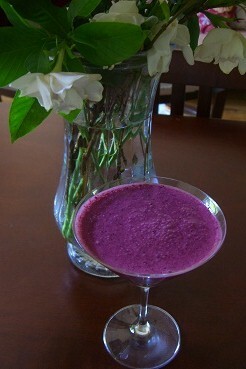 The mulberries add a nice bold flavor and slight tartness to the mulberry mocktail. The drink had just the right amount of sweetness. Nutrition note: The purple color of the mulberries comes from anthocyanins, a type of phytonutrient which has many health benefits including being anti-inflammatory. Jamie says: Love the taste of PB&J? How about with a glass of milk? 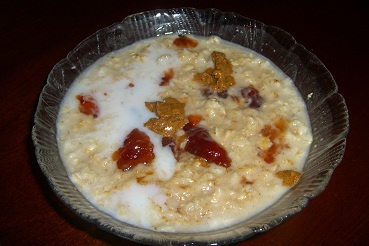 Then give this oatmeal recipe a try! Pour oats into a microwave-safe bowl. Add water. Microwave for 3 minutes. Stir. Scoop almond butter on top, then spreadable fruit. Stir lightly so that there are still chunks. Pour skim milk on top. Serves: 1. Enjoy! Tastes like PB & J in a bowl. I enjoyed the “chunks” of almond butter and spreadable fruit. Nutrition note: Are you hungry right after breakfast? Nuts and nut butters can help you feel full longer. They have protein and fat which aid in satiety. Set a burner on high heat. Add the cooking rack to the bottom of the pressure cooker. Pour 1 1/2 cups water (for pressure cooker) into the bottom of the pressure cooker. In a small/medium-sized metal bowl that will fit loosely inside the pressure cooker, pour 1 1/2 cups water (for rice) and 1 cup rice. Place bowl inside pressure cooker. Lock lid in place. Place the pressure regulator on vent pipe and cook for 10 minutes with pressure regulator rocking slowly- you will need to lower the heat to medium (the air vent/ cover lock will rise). Remove from heat and let the pressure cooker sit- allowing the pressure drop (the air vent/ cover lock will fall). Remove the pressure regulator and the lid. Pour rice into a serving bowl. Drain water from bottom of pressure cooker. Clean bowl and repeat step 2 twice more. Add Smart Balance, salt, and parsley to all the rice. Mix well. Serves: 12. Enjoy! Tastes nutty and healthy. Moist and fluffy. Goes nicely with black beans. Using the pressure cooker was easy and quick. Give it a try. Nutrition note: Preparing healthy meals doesn’t have to take long. Use a pressure cooker to make healthy foods in a hurry. 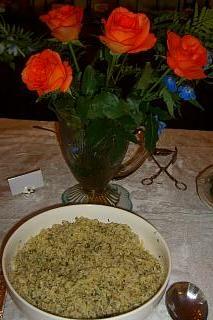 Jamie says: I went to a Gainesville District Dietetic Association (GDDA) potluck tonight. I decided to get a little creative with a bag of broccoli slaw I bought the other day, so I made Pistachio Pomegranate Slaw. Everyone ended up bringing slaws and “salads,” but it was nice to have the healthy variety (and some cheesecake). I even tried my first mulberry. I’m enjoying trying new foods. The other week it was sardines, now it’s mulberries. What’s next? Pour broccoli slaw, dressing, and raisins into a bowl with a lid. Shake well and stir with a fork. Refrigerate for 10 hours. I left a bowl of it for K in the fridge. She came in my room with it while I was blogging and described it as: “Sweet and tangy with a subtle pistachio taste.” I say it tastes refreshing and healthy. I like the array of colors. There’s not too many purple foods out there and there’s a hint of purple in both the broccoli slaw and the pistachios. Nutrition note: Broccoli slaw is low in calories and high in antioxidants vitamin A and vitamin C. It’s made with the inside stem of the broccoli, carrots, and red cabbage.